It's time to channel your inner wild child, whether or not you're going to Coachella. Terry baseball jacket, embroidered cotton top and cutoff boyfriend shorts c/o Denim and Supply, Nasty Gal hat, Zero UV oversized sunnies, Pura Vida bracelets, Marc Fisher wedge sandals. Shot by Marc Lieber in Los Angeles, CA. Either way, it's safe to say the look is here to stay, so there's no better time than now to incorporate a tad of the fest spirit into your wardrobe! The easiest way to do so? Accessories! Just stack up some cute bracelets, grab a fun pair of sunnies and toss on a wide brim hat or headpiece and you're all set. Easy breezy. And lucky for you, I teamed up with ZeroUV and Pura Vida bracelets in honor of this weekend to giveaway some fun accessories below! Check it out and don't forget to enter & tell your friends. Just make sure they promise to share the loot with you if they win. 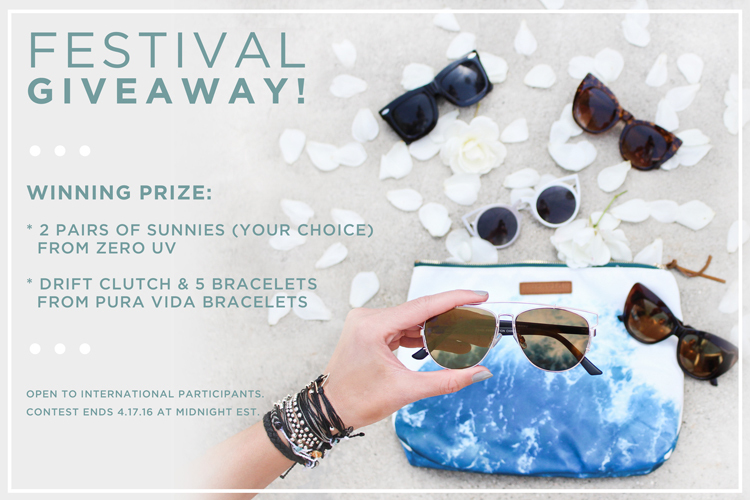 ZeroUV x Pura Vida Festival Giveaway! 3. Comment below with your email & let me know of any extra entries! Contest ends on Sunday, April 17th at midnight EST. Loving this entire ensemble! Great style darling. This boho look is so gorgeous, love the top and your heels! This embroidered top is genius - you look incredible in it. Perfect for spring! Love the shades and hat! Great style girlie.